Fall has finally arrived in North Texas! Fall (before the frost), is the best time to divide and plant your perennial flowers so that they have time to develop good, strong root systems for spring bloom. Perennials are plants with a life cycle of three or more years, compared to an annual that lives for one year. 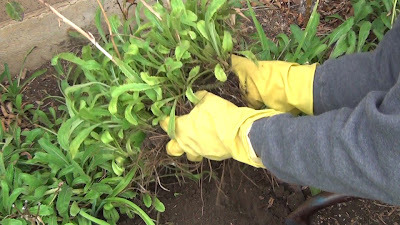 Perennials should be divided and transplanted every three years. When perennials are too crowded they produce less flowers and wilt easily because too many roots are vying for water and soil nutrients. Some perennials that I will be dividing and transplanting in this blog are: daylilies, Shasta daisies, Bearded irises and Spider lilies. A perennial flower bed that needs to be divided. Shasta Daisies (front), daylilies (left) and Bearded irises (back). 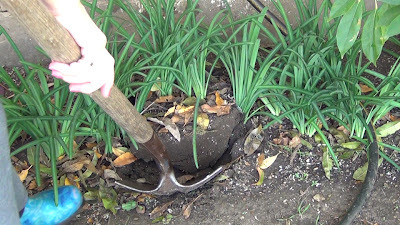 To divide the daylilies, place the shovel approximately 8" from the stem of the clump of the lilies and push the shovel straight into the ground, submerging most of the head of the shovel. 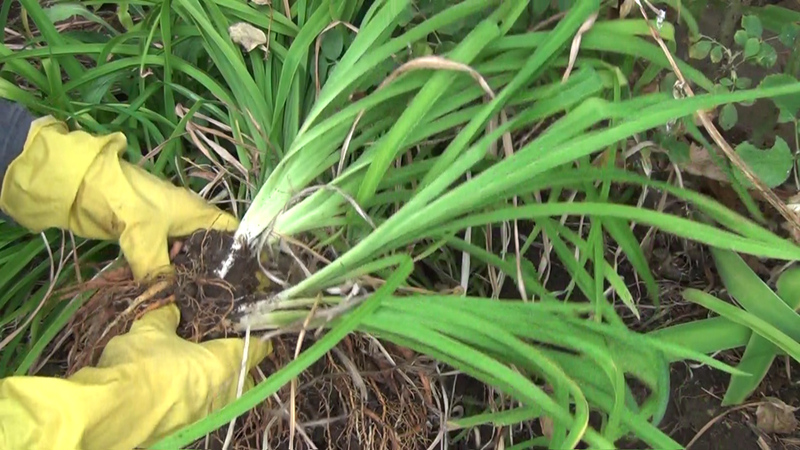 Dig in this manner in a circular pattern around the clump, then lift the clump out of the ground. 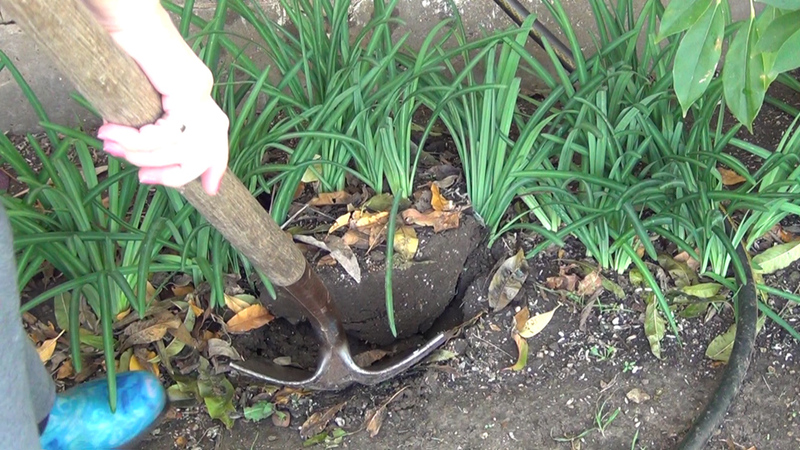 If you are not strong enough to get the shovel deeply into the ground then use the weight of your body to dig deeper by placing a foot on each side of the top of the head of the shovel and lean into the handle (like a pogo stick), and gently move your body forward and backward sending the shovel deeply into the earth. Dig the clump of crowded daylilies out of the ground. Gently remove extra dirt from the roots with your hands. You will now see the individual plants that need to be separated. 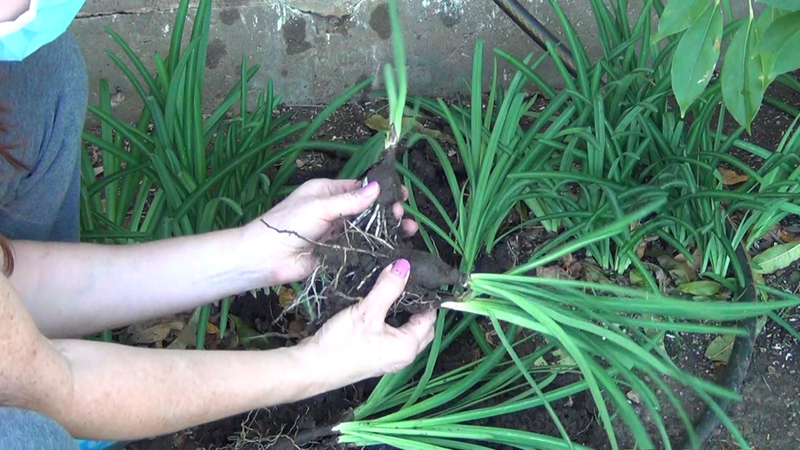 While holding the roots only, gently divide the daylily plants from each other. 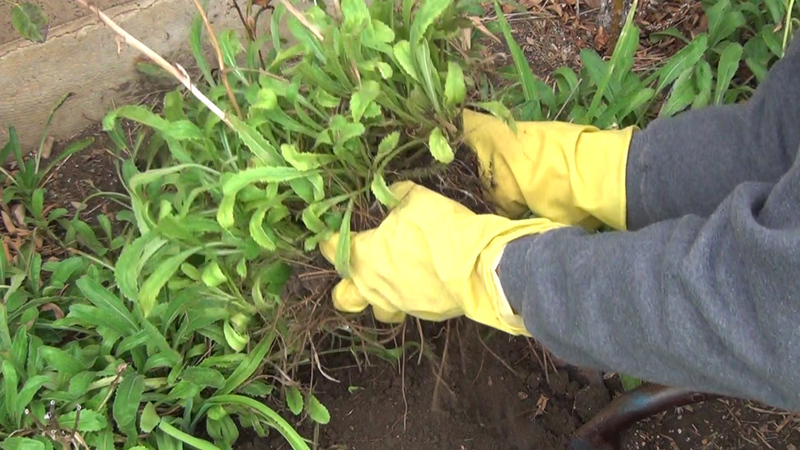 Dividing the roots of Shasta daisy plants. 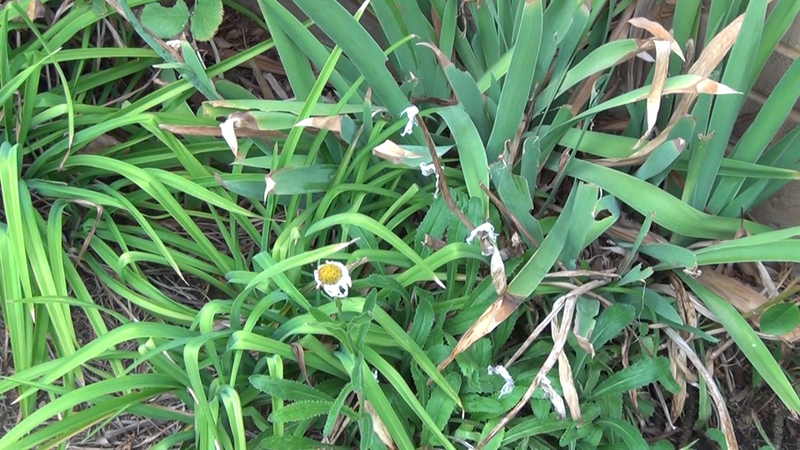 Dig the Shasta daisies the same way you dug the daylilies. Gently break off the extra dirt around the roots so you can see them better. You will now see individual plants connected by long roots. Gently separate these plants from each other while holding the roots. Some plants may require that you break them off of a large main tap root. Make sure each plant has a root attached. 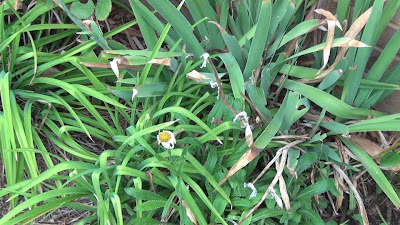 An individual Shasta daisy plant that has been separated from the clump. Since Bearded Irises grow from horizontal rhizomes you may need to begin to dig more than 8" from the base of the plant. Most of the rhizome can usually be seen near the top of the ground so just clear any debris from around the plant so that you can see the formation of the rhizomes and not cut into them with the shovel. 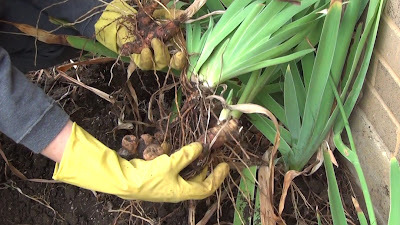 Once the rhizomes are lifted out of the ground, the individual irises and their rhizomes are easy to divide. A fan shaped iris plant will be connected to each rhizome. Lifting a clump of spider lilies out of the ground. Dig spider lilies the same way daylilies were dug. Spider lilies grow from bulbs that separate easily from each other. Do not hold the green parts of the plant. Hold the bulbs in your hands as you separate them from each other. All of the perennial flowers just discussed grow best in full sun, in a southern or eastern location in well drained soil. To reinvigorate your soil, add some organic humus to the garden bed and dig it into the old soil. There are different ways you can design your perennial flower bed. You can plant the perennial flowers in groupings of one type of flower or in rows. The most important part of planning the perennial bed is to plant the taller plants behind the shorter plants and leave enough space between the individual plants. I also like to plant shorter blooming spring and winter annual flowers in front of the perennials so that there are beautiful flowers blooming in the bed year round. Spring annual flowers that look nice in front of the perennials are vinca, dwarf marigolds, short zinnias and rose moss. Winter flowers that look nice in front of the perennials are dianthus and pansies. Here is a guide the to the height and spacing needs of the perennials. Daylilies grow16" to 24" tall depending on the variety. Space 12" apart. Blooms in the spring and fall. The tops of the daylilies will die down after the first frost of winter and will re-emerge in spring from the roots. Shasta Daisies can grow up to 36" tall (Alaska variety). Space 12" apart, Blooms late May and June and in the fall. Varieties like Alaska will stay green in the Texas flower bed year round. Trim off spent flowers (dead head), to prolong bloom. Bearded Irises grow 16" to 24" depending on variety. Space 12" apart. Blooms in the spring. Foliage remains green year round. Spider lilies grow 12" to 18" tall. Space 6" apart, blooms in September. Spider lily blooms emerge from a single stalk in September followed by green foliage that grows until late spring and then dies back down only to repeat the process all over again beginning next September. I like to plant shorter annual flowers in front of spider lilies since they have short-lived, but spectacular blooms. Water the perennials well after planting and when the soil dries. Click the subscribe icon to subscribe to this blog.